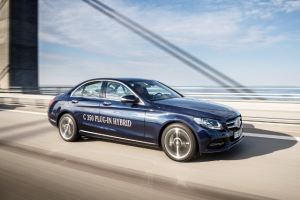 The Mercedes-Benz C-Class plug-in hybrid was the UK’s second most registered ultra-low emission vehicle last year, outnumbering the diesel hybrid more than three to one, according to new Department for Transport data. SMMT figures show 35,447 Plug-in Car Grant eligible vehicles were registered in the UK during 2016. Based on DfT information to the end of the year, the Mitsubishi Outlander PHEV accounted for 27.8% of those, at 9,844 units, and more than four out of every five Outlanders (83.7%) registered last year was a plug-in hybrid. The Mercedes-Benz C 350 e overtook the Nissan LEAF last year, with 5,395 units registered to the end of 2016. That compares to 1,155 examples of the C 300 h – the diesel-electric hybrid C-Class – and 4,666 Nissan LEAFs during the same period. Plug-in hybrids remain a preference among UK drivers; the BMW 330e PHEV accounted for 3,510 units against the i3’s 2,520, and three quarters of the latter had the range-extender petrol engine. Likewise, 2,842 units of the Golf GTE were registered last year compared to 36 e-Golfs, while almost a third of Volvo XC90s (1,600 vehicles) were the T8 Twin Engine PHEV. By comparison, the Tesla Model S came in second behind the LEAF with 2,456 units registered, followed by the Renault ZOE at 1,761.